Saturday evening, August 4: Q-music the Party! 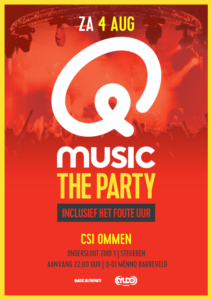 Saturday evening 4 August, from +/- 21.00, is the party night of CSI Ommen. You have to be here! Q-music the Party will make a spectacular evening with 1 hour of music from the wrong hour. And another nice fact: entrance is free!